I love the sweet wines from Sauternes, and I lived too long with the illusion that the wine growers in this region were the only that could produce sweet wine of such an outstanding quality. This illusion was seriously challenged when I had my first taste of an aged Tokaji. This Hungarian wine had a slightly different taste but was absolutely equal to a good Sauternes. Then I tasted a bottle of Bru-Baché Jurancon la Quintessence 2004, and suddenly I realized that I lived in an illusion. In July I tasted another variety, a Louis Freyburger & Fils Gewurztraminer 2001 Vendange Tardive at L'éveil des Sens. The name means late harvest, and refer to the fact that the wine is made from grapes that are allowed to hang so long that they start to dehydrate, thus concentrating the sugar. The other day I went to my wine merchant, and found that there were no half bottles of Sauternes. To buy 75 cl sweet wine for three, would be an overkill. I asked the staff whether there was some other wine to serve to a bloc of duck liver. He recommended a bottle of Donnafugata Ben Ryé Passito di Pantelleria 2006. What a wine! Even Sicilians may compete with Sauternes. It is made from 100% Zibibbo, or Moscato Di Alexandria. The producer states that the grapes are "ripened and dried in the wind and sun of the island. Sipping wine, perfect with herbed cheeses, foie gras, and sweet preparations of the Sicilian traditions. try it with guiandia." Orange colour, wonderful and complex aromas of apricot, honey, and citrus. Hints of spices, nuts and minerals. This is a highly recommended wine, but it is expensive - close to €25 for 37,5 cl, but it is absolutely worth it. 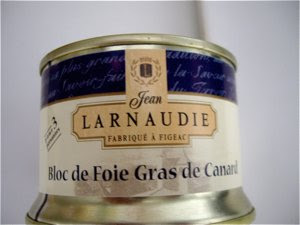 It was perfect to the bloc of duck liver from Jean Larnaudie, a French producer from Figeac in the Mid Pyrenees.